Perhaps my least favorite international trip was when I went to Thailand a few years back. I could get into massive detail as to why I hated this trip (think group trip for school with strangers and no translator), but I'll instead include one positive story of the "adventure." (It's all blogged here if you want to read more or see pictures!). One Sunday, while we were visiting a church in Vientian, Laos, I met a local gal who spoke perfect English (a rarity). Her name was Sophia. We asked each other questions as little Lao children watched the foreigners interact with one of their own. She finally noticed that none of us had joined the large crowd for lunch and arranged us a table. No utensils this time, just plates of meat with vegetables through the catalyst of sticky rice balled up in ones hand. Of course the only thing on the table that was vegetarian friendly was sticky rice, and I ate as much as I could stomach to suppress my hunger. Sophia noticed that I was helpless and walked me down the street to find some food. A woman bent over a rusty cart making some kind of fried coconut milk with corn and green onion ensemble. Her skillet was similar to one we use for Danish breakfast at home, with a dozen circular inlets which produce a round shaped fried food. Sophia purchased four for me and then some friend banana from another shop across the street, and refused my money when I offered. She explained to us that her father was a pastor and thus she had always grown us Christian, though had a hard time at school as others did not understand her cultural choices. All this time, I could not keep my eyes off her beautiful earrings, made of Tibetian silver and a kidney wire. When I mentioned that I liked her earrings, she immediately took them off and put them on my ears. She said she was just happy to help me find food and that the earrings were the least she could give me. I didn't deserve anything from this gal, nor did I have anything to give her in return but humility and thanks. (You can see Sophia and the kids of the church in the top picture, as well as me wearing the earrings later that day below). While shopping at Beadazzled in Baltimore, guess what I found? The silver tribal beads! I of course bought them right up and put them on some kidney wires. They are available on my Etsy shop here. _______________________ Also found some great inspiration in LA. For whatever reason (other than the fact that LA is rad? 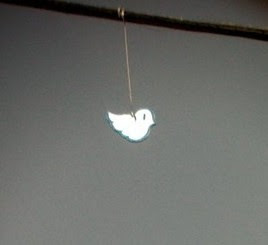 ), I have spotted a bunch of these little tweet-like birds hanging from cables, mostly in the Hollywood area. I dig it and just had to buy these precious bird charms as a reaction (they are 12 x 17 mm and 14k gold plated with matt finish). Of course no bird necklace is complete without a Swarovski crystal and cute little bat-like charm to top it off. (Bird picture by my friend Josh). You can view this necklace on my Etsy shop here.